As a company, we invest in resources and training opportunities for our guides and we think that you will notice the difference this makes on our trips. Mountain Trip has always felt more like a family than a corporation and this is a big reason so many of our guides return year after year. As a result, our lead guides are among the most experienced and respected on Denali. The owners and staff of Mountain Trip are keenly aware that we are all working for the public good. It is an incredible honor to have the privilege to share wild places with our guests and to act as stewards of our natural mountain resources. We live simply and are a small enough company to be able to give every climber who contacts us personal service. Ask other climbers about us! Mountain Trip is the premier source for providing climbers with experienced guides and the highest quality customer service in the industry. We will not place the third goal ahead of the first two; however, by hiring, training, supporting and retaining the very best guides for the terrain in which they are guiding, we do a great job of helping climbers stand on top of their mountains. We are climbers helping other climbers pursue goals that might otherwise not be possible. Our climbers and our guides are our most important resources and we work tirelessly to support everyone who climbs with us. We invite you to reach out and contact us to experience the Mountain Trip difference. 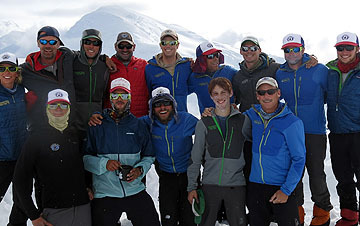 This group of Mountain Trip guides at 11,200′ on Denali have over 120 collective trips up the mountain! The National Park Service has established guidelines for who can lead commercial Denali expeditions. We think those official standards are a bit vague, as they require each team to “have at least one guide that has guided on Mt. McKinley previously.” Additionally, we also feel that Denali is so different from other mountains that it demands a specialized skill-set to safely and successfully guide it. Anyone can have an easy trip or two or even three on Denali and feel like he or she has a good grasp of how to guide the mountain. It’s not until you’ve seen the many faces of Denali that you truly gain the respect and skills to competently manage the constantly changing conditions that will be thrown at you. All of our Lead Guides have guided a minimum of five Denali expeditions. This is merely our promise to you that we will continue to lead the way with the most experienced guides on Denali. As you research potential guide services, ask other outfitters what their official policies are for their guides’ Denali experience. Mountain Trip is a small outfit with a family feel and we like it that way. We have grown and will continue to grow, but we’ll never offer any trips that we feel lack … soul. Maybe we’ve watched too many surfing videos, but we honestly care about only offering trips that we feel have a healthy dose of soul. Obviously this is subjective, but rest assured that if we cannot provide an expedition or course that has intrinsic value to its participants and provides it at the highest quality standard, we will not offer it. We love what we do and it shows. Mountain Trip has made a commitment to Low Impact Practices in all aspects of our business. We travel to some of the most beautiful and pristine areas in the world and do our best to minimize the physical and cultural footprints we leave behind. All of our guides are trained in the Leave No Trace code of ethics and we strive to make other business choices that will help make our planet an even better place to live. Mountain Trip firmly understands that the choices we make affect our footprint on this planet. We try to minimize our impact and help make our world a better place by purchasing healthy expedition food with an emphasis on organic products that use minimal packaging, and we pack out our trash on all of our expeditions. We support vendors who practice lower impact policies. Our Mountain Trip T-shirts are made from organic bamboo and cotton and over the years we have utilized a solar powered web host to power our website. Our commitment to environmentally sustainable practices is also reflected in our choice of companies with which we work closely We have partnered with Black Diamond Equipment, a company that has instituted a chemical and fluid recycling and reusing program that has greatly reduced its effluent discharge. In addition, they began operating with their own wind and solar generated power in 2007. We also enthusiastically support Patagonia, which has committed to using only organic cotton in its cotton clothing and is a forerunner in using post-consumer recycled material in an ever-growing number of their products. Patagonia selected Mountain Trip as one of their “Pataguides” guide services. Patagonia founder Yvon Chouinard published an excellent book/manifesto on his business philosophy called Let My People Go Surfing, which we feel also outlines many of our company’s ideals. Even if you’re not a businessperson, we encourage you to pick it up and read it. Mountain Trip donates at least 2% of profits to Earth Friendly Organizations. Recipients of our support include the San Juan Riding Program, which offers riding therapy to folks with disabilities, the Telluride Adaptive Sports Program which provides skiing and other sport opportunities to people with disabilities, the Colorado Avalanche Information Center, and the Telluride Valley Floor Project. One of our favorite causes is Skills For Living And Learning, a non-profit school for special needs kids in SW Colorado, to whom we have donated over $20,000 in recent years. More recently, we have begun supporting the Just For Kids Foundation, a non-profit based in Telluride, CO that serves children in our local area.